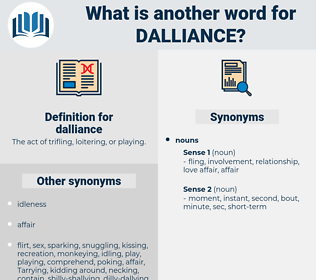 What is another word for dalliance? The act of trifling, loitering, or playing. responsibility, duty, obligation, labor, work, drudgery. Wonder and terror seized on Murtough at her beauty, and he knew not if he loved her or if he hated her the most; for at one moment all his nature was filled with longing and with love of her, so that it seemed to him that he would give the whole of Ireland for the loan of one hour's space of dalliance with her; but after that he felt a dread of her, because he knew his fate was in her hands, and that she had come to work him ill. He had been too busy to take her until now; the serious duties of his position had allowed no time for dalliance. 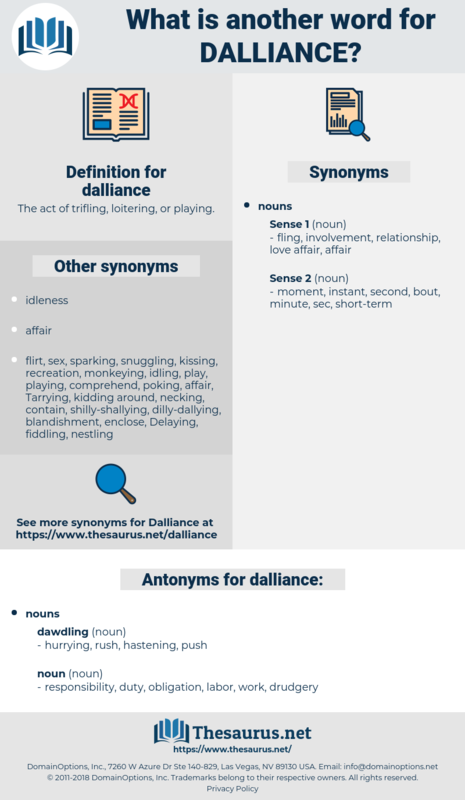 dealing, dullness, dilleniaceae, delonix, detailing, doweling, data link, daylong, dealings, deadliness, dawdling, dwelling house, dolmas, dead language, dwelling.